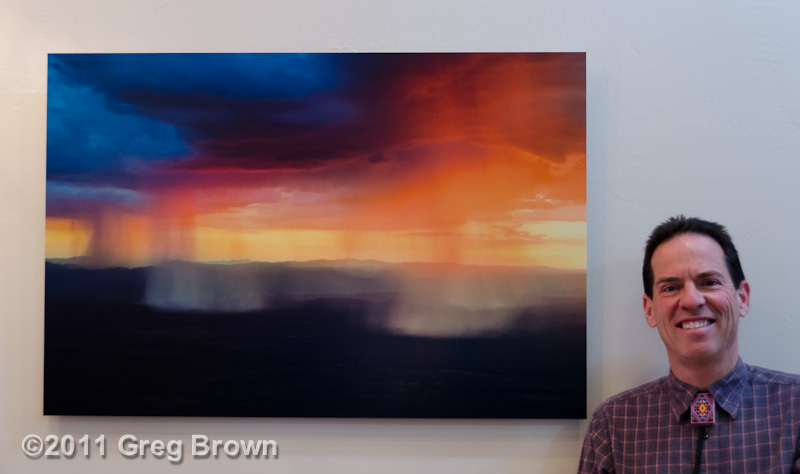 One-time opportunity – Save on Greg’s “Flying Carpet” Fine Art Prints! Save on a Flying Carpet Fine Art Photographic Print! Over the past 18 months I’ve enjoyed as many as three Views from the Flying Carpet photography exhibits running concurrently. That’s been a thrill, and the work has been enthusiastically received. Normally, my prints are individually made to order, including exhibit sales. So now, as the exhibit prints come down, I find myself lacking display or inventory space. Therefore, I’ve decided to discount the previously-exhibited prints, and cover sales tax or domestic shipping. That amounts to savings of $100-400 per print, depending on size. All prints are museum-mounted with non-glare lustre finish*, and have been displayed in secure museum or gallery settings. This offer applies only to the specific individual prints listed in blue. Please CONTACT ME DIRECTLY TO ORDER discounted prints. This is a one-time opportunity, so if your dream print is on the discount list, act on it! Top photo: Sunset Rains. Lower photo: Sunset Over Window Rock. *Frameless, reflection-free “museum mount-lustre” prints are bonded to Dibond aluminum-and-polyolefin sheet with museum-back subframe, with a non-glare UV-protective film laminate over the print surface. (See example.) Greg’s favorite! Dark clouds fringed the western sky when I departed Prescott. With appointments to make, I’d monitored the weather all day. Our home airport of Flagstaff expected gradually lowering ceilings after 6pm, and snow beginning after 8. I picked up Jean in Scottsdale at 4:30, later than I’d hoped, but a tailwind promised to hurry us home in under an hour. Our destination still reported clear skies when we took off, as did all stations along our route, but those ominous clouds approached relentlessly from the west. Williams, 40 miles west of Flagstaff, reported visual conditions in light snow. In any case, we carried plenty of fuel to land at Sedona, Cottonwood, or Winslow, or return to Scottsdale. Halfway home over the Verde Valley, I noted shades of green threatening Flagstaff on the datalink weather display. Little precipitation was likely reaching the ground, but this was unexpectedly early. Then the tint changed to pink. Snow! I told Jean we might be driving a rental car home from Sedona tonight. “But we’ll arrive well before 6,” said Jean, taking the forecast literally. “Surely, we’ll beat the weather.” Maybe she was right. Flagstaff’s Pulliam Airport still reported good visual flying conditions: clouds at 2,400 broken, 6,000 overcast, and 9 miles visibility in light snow. “Flagstaff is still reporting VFR,” he replied, “but the last two pilots landing there thought a visual approach would be sketchy, so both shot the ILS.” These were turbine aircraft descending from the flight levels, however, so they’d need to penetrate the overcast while we approached from underneath. Sedona soon sparkled delightfully beneath us, crowned with a solitary snow flurry illuminated by the setting sun. Ahead the distant horizon bisected an inviting if faraway sliver of sky beyond the overcast. It’s always a bit discomforting flying under a cloud ceiling onto the plateau. Here you are cruising comfortably under a high overcast, and the ground suddenly rises up to squeeze you. Confirming as we approached that the ceiling indeed floated a healthy 2,500 feet above the plateau, I took momentary leave from Center and radioed Flagstaff tower that I was 7 minutes south and requesting the trend. “The weather’s definitely deteriorating,” replied the tower controller, “but we’re still decent VFR, especially to the south where you’re coming from. If it’s a matter of just 7 minutes you should be in good shape.” Retrieving instrument charts for backup, I advised Albuquerque that we’d proceed visually to Flagstaff with Sedona as our alternate. Topping the plateau, we intercepted Interstate 17, which would lead us directly to the airport and ensure terrain clearance. Flight conditions remained excellent, so I said goodbye to Center. “Be safe!” said the controller as we cruised blithely homeward. 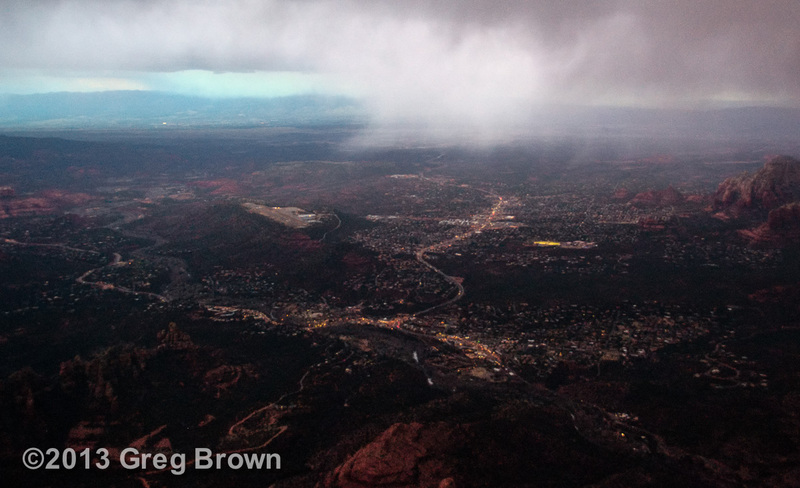 Photo: Sunset illuminates an isolated snow shower over Sedona, Arizona, on our flight home.